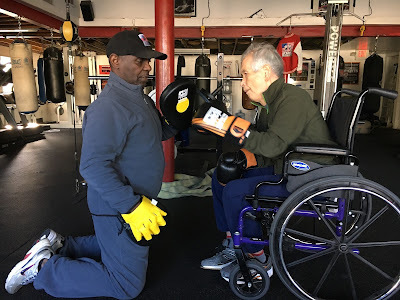 A few weeks ago we learned from Ken's first wife Barbara of a new therapy for Parkinson's Disease - Boxing!! It seems that the exercise of intense punching improves physical performance, stimulates the brain and can even reduce the amount of medicine needed. We decided - what the heck - let's go for it. We did a google search and found "Washington Boxing Academy" around the corner near King of Prussia. We sent a message to the coach and owner - Mr. Arden Washington. He wrote back and said "Come on over and let's take a look at this Ken Kono." We've been back three times and each time we come away just a little more amazed and up beat. Mr. Washington could not be more inspiring or encouraging. And Ken is having more fun than he has had in a year. Here's a photo of Ken and Mr. Washington during their first boxing session. We've scheduled to go twice a week for the foreseeable future. Soon that man will be walking on the moon.